Ordering takeout and buying pre-cooked food all the time is a habit that is not only unhealthy but expensive. Even if you’re buying cheap food, all those costs will rack up a serious bill and take a dent out of your monthly budget. This includes your seemingly inexpensive yogurt habit. The VitaClay Yogurt Maker is the answer to your food and yogurt woes. This one-of-a-kind dual-purpose device lets you create healthy, delicious food in the slow cooker as well as 2-quart batches of flavorful yogurt in a removable clay insert. But what truly sets this yogurt maker apart from others is that it uses eco-friendly clay. Other yogurt makers made out of plastic or metal leaches chemicals and are harmful to the environment. This one doesn’t, so you never have to worry about nasty toxins touching your ingredients. It’s lead-free, too! It works with low-temperature settings that promote a high probiotic count, which means lots of gut-loving goodness for your tummy. The VitaClay Organic Slow Cooker and Yogurt Maker is also pretty compact. It can be used in places with limited cooking spaces including small studio apartments, dorm rooms, and even the office. Just imagine the ease with which you can make delicious, probiotic-rich yogurt or overnight oatmeal, rice, pot roast, stews, meat broth, and vegetable dishes. What’s more is that it can also be used to cook homemade baby food, steamed fruit, chewy custards, chicken stews, and rice cereal for your babies. 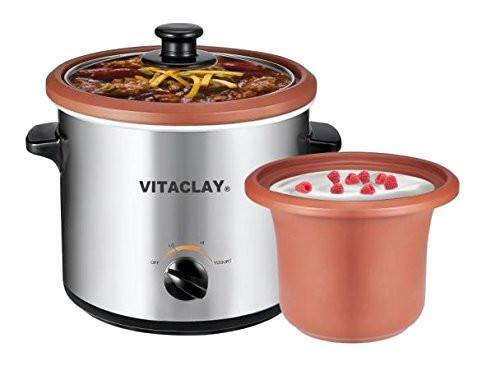 Having the VitaClay Organic Slow Cooker and Yogurt Maker allows you to get more out of your day because it does all the work while you get things done. Whether you need yogurt or a tasty savory dish, this versatile and dual-purpose device saves you both time and money. The VitaClay Yogurt Maker is an essential tool for any homemaker. In just 8-12 hours, you can make large batches of Greek yogurt as well as yogurt cheese, as well as tons of different soups, stews, and broths. Not sure where to start? Just refer to the free recipe book that comes with the device. Weighing just 1 pound and measuring 9.2 x 9 x 8.6 inches, the VitaClay Yogurt Maker is a compact yet powerful tool. With all the things it can do, this machine will soon become your best friend in the kitchen. Working in a small kitchen is never a problem because it’s so compact. But don’t let its size faze you; this is a powerful machine that can whip up both yogurt and food good for two or even three people. It can also make baby food. Storage is simple because it really doesn’t take up a lot of space. Unlike other yogurt makers in the market, this is designed with an organic clay insert that is easy to clean, and free from lead and chemicals. 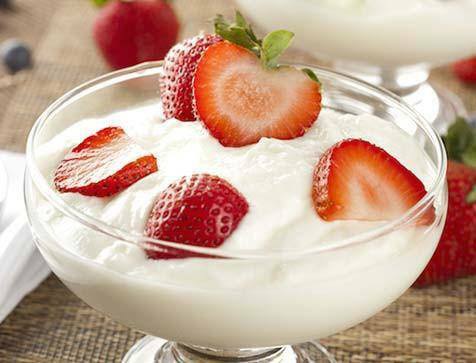 There are three temperature settings including one that’s specifically designed to help you make a probiotic-rich yogurt easily. Other temperature settings are perfect for making soups, stews, and savory dishes. One pot meals have never been so simple to make. Take it from VitaClay, a brand known for making smart, non-toxic clay cookware. They have an impressive line of healthy and safe clay cookware, and this yogurt maker is one of its most popular products. There are so many great features of the VitaClay Yogurt Maker that it’s hard to choose just one. Its versatility certainly makes it stand out. However, it’s also really simple to use. Whether you are a seasoned homemaker or have just started out, you will find many uses for this smart kitchen device. It’s good to note that while clay cookware is among the healthiest out there, it’s also fragile. To prevent cracking, simply soak the clay pot overnight before you use it. When cleaning, never place the clay pot in cold water while it’s still hot or even warm because this is a sure-fire way of cracking it. The VitaClay Yogurt Maker is delicate, but with some care, you can prevent cracking. Quick, easy, nutritious yogurt and meals can be made from the comfort of your own home with the VitaClay Yogurt Maker. Just make sure to read the instructions properly, and you’re good to go. You can purchase the VitaClay Yogurt Maker from many sellers online. Amazon does stand out as a trusted and reliable online merchant for this product and many others, based on feedback as well as customer reviews. Functionality, price, aesthetic, size and weight, and above all utility… the VitaClay Yogurt Maker just has it all. It’s like buying two kitchen devices for the price of one. From yogurt to rice, stews, soups, and many other healthy dishes, this is an essential tool for homemakers who want to make their own nutrient-rich foods at home.